Sample Orbit Logic Prototype SSA Sensor Tasking Schedule Displayed in Systems Tool Kit (STK). Image Credit: Orbit Logic Inc.
June 6, 2016 – Orbit Logic has signed a Phase II SBIR contract sponsored by the Air Force Research Laboratory (AFRL) to research and implement software to optimize the scheduling of observations of known space objects and the search for unknown space objects from ground observation sites for improved Space Situational Awareness (SSA). 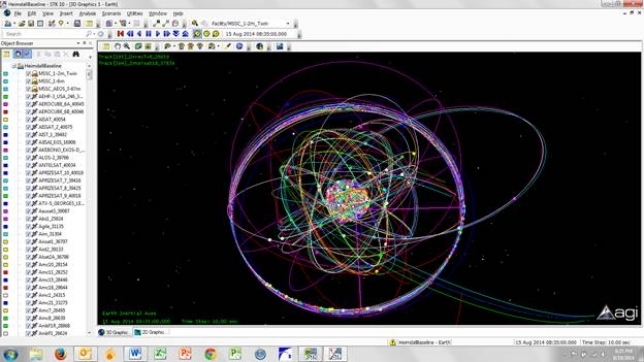 Orbit Logic is teamed with the Colorado Center for Astrodynamics Research at the University of Colorado at Boulder and the University of Texas at Austin for this effort. Orbit Logic will be working closely with the AFRL team at the Maui Space Surveillance Site in the execution of this contract. The work will leverage Orbit Logic’s existing scheduling software framework to rapidly prototype and compare new algorithms, refine figures-of-merit (FOM), and simulate and compare resulting observation schedules. The University of Colorado and University of Texas will develop and refine Finite Set Statistics (FISST) methods to prioritize known-object observation opportunities and search areas for unknown space objects that are then scheduled within the Orbit Logic scheduling software. This contract is a continuation of a successful Phase I contract in which Orbit Logic and its subcontractor team developed and demonstrated prototype software including an SSA-specific FOM, FISST prioritization and target density prediction methods, and methods for optimized tasking of ground sensors for SSA observations. The proposed software solution will provide a configurable, automated system to improve sensor tasking efficiency and responsiveness for SSA applications. The FISST algorithms for task prioritization, specialized scheduling algorithms for sensor tasking, and configurable SSA-specific figure-of-merit will together provide optimized and tunable scheduling for the Maui Space Surveillance Site and other sites and organizations across the U.S. military and for allies around the world. Orbit Logic Incorporated, specializes in software for mission planning, scheduling, and space situational awareness. Orbit Logic’s operationally proven software products — Collection Planning & Analysis Workstation, STK Scheduler, Order Logic Web App, Onboard Autonomous Planning System, and SpyMeSat mobile app – create better plans faster with fewer resources, more insight, and less risk. Highly configurable desktop, web, mobile, and onboard software supports analysis and operations for domains including aerial/satellite imaging and space/ground networking. The Colorado Center for Astrodynamics Research is dedicated to the study of astrodynamics and the application of satellites to science, navigation, and remote sensing of the Earth. Hosted by the Department of Aerospace Engineering Sciences, in the College of Engineering and Applied Sciences, CCAR was established in 1985 as a key component of the University of Colorado at Boulder’s emphasis on space science. Since its inception, CCAR has researched methods of precise orbit determination for missions such as TOPEX/POSEIDON, Jason, and others. The University of Texas at Austin, through its Department of Aerospace Engineering and Engineering Mechanics, conducts interdisciplinary research in astronautics, earth-space information systems, aviation, energy, robotics, theoretical and experimental mechanics, and computational engineering. Founded in 1981, the UT-Austin Center for Space Research (CSR) is a leader in orbit determination, space geodesy, and the study of the Earth and its environment through its participation in NASA missions such as ICESat and GRACE.